In the last week, I have become aware of four companies developing new regenerative medicine product for Musculoskeletal Care of the Aging Athlete. What I find extremely interesting is the fact that three years ago, when I entered the practice of using bone marrow aspirate concentrate in an attempt to postpone or possibly avoid a joint replacement in an arthritic knee or hip, the orthopedic community was very critical telling patients that regenerative medicine was still ten years away. 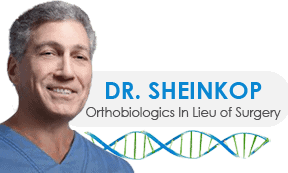 Fast forward three years and four new initiatives into the emerging field of regenerative medicine have come to my attention; underwritten by orthopedic surgeons or companies that have produced prosthetic joints for over 30 years. All of the product in development has not yet been approved by the FDA and many developing products are still being tested in Europe. What we at the Regenerative Pain Center offer is within FDA guidelines and approved by all regulatory agencies of the government. At the same time, I am very much aware of what is taking place nationally and internationally; when a newer regenerative medicine product is made available and FDA approved, we at the Regenerative Pain Center will be aware and closely evaluate as to whether it should be incorporated into our service line. Let me be candid, our success rate is not 100 per cent. There have been three or four hip patients that have not provided the outcome the patient sought or that I hoped to provide; namely, avoidance of a hip replacement. On the other hand, the vast majority of hip bone marrow aspirate concentrate procedures are still allowing the patient a very full return to activities with about 70% percent patient satisfaction at a minimum of one year. When it comes to those who sought help for an arthritic knee, we have done even better with an 85% patient satisfaction outcome at a minimum of one year. Several of those patients had reached a plateau at six months but realized a marked improvement in the pain score with a Platelet Rich Plasma refresher. When a patient elects to under go a bone marrow aspirate concentrate hip or knee intervention at the Regenerative Pain Center, that patient may be assured that what we are doing is based on FDA guidelines and our clinical outcomes research. In addition, each patient should recognize that Regenexx continually statistically reviews our outcomes data. Last week, we recognized that those who underwent Cellular Orthopedic interventions for an arthritic knee did best when the cell count of mononuclear cells exceeded 400 million. Be aware that we count the cells in every Regenerative Medicine procedure. Our approach is no longer “this is the way we do it.” Our approach is based on experience and outcomes research, the same that I used in a long joint replacement career.